Romanian readers can now find Dvora Meyers’ book on the evolution of elite women’s gymnastics on local shelves, a perfect read during the Olympics. Just as last year, we are happy that the amazing works of our speakers are being translated into Romanian. 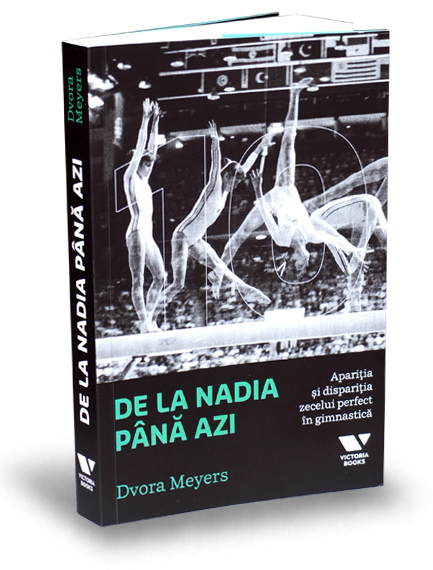 Dvora Meyers’ The End of the Perfect 10: The Making and Breaking of Gymnastics’ Top Score hit the stands last week, at Editura Publica (Victoria Books). It came just in time for this summer’s Olympics, which mark the fortieth anniversary of Nadia Comaneci’s “Perfect 10”, as well as 10 years since the introduction of a new scoring system that made sure we will not see any more Perfect Tens in one of the most popular Olympic events. These are some of the themes discussed by American journalis Dvora Meyers in her book, which is based on a dozens of exclusive interviews with professionals. Dvora, who practiced gymnastics for 12 years, offers an insightful account of the controversial world of gymnastics and explains how the recent changes of the scoring system have influenced the sport, its hierarchies and the type of gymnasts that dominate it. Dvora answers questions that gymnastics fans have been asking since the last perfect score was handed out over twenty years ago. She reveals why successful female gymnasts are older and more athletic than they have ever been before, how the United States became a gymnastics powerhouse, and what the future of gymnastics will hold. At our conference, Dvora will talk more about the challenge of writing about niche topics and groups for broader audiences without oversimplifying them. Her book will be available at the conference. Register here if you want to meet Dvora, and maybe get your copy signed. The Romanian translation of The End of The Perfect Ten is supported by Erste Asset Management. How kids can learn computer programming through games and fun.